Last Hope’s being showered with tiny kittens. 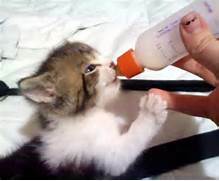 We need to supply our bottle feeders with specific items for orphan bottle babies. YES, we need more volunteer bottle-feeders too! Please consider purchasing from the list below, and donating the items to Last Hope for our infant kitties and their dedicated bottle feeders. The first 4 products are on Amazon, Amazon Smile or Amazon Prime. Rest are in the grocery store. Your “Kitten Shower gifts” can be dropped off at our Wantagh Adoption Center, 3300 Beltagh Ave, Wantagh 11793; OR shipped directly to Last Hope at PO Box 7025, Wantagh 11793. 3) Pet Heating Pads-cheap ones are fine. Extra covers too. 4) Vicks Comfort Flex Rectal Thermometers. 5) K-Y soluble lubricant for taking rectal temps.